New Free Slots, Free Spins Bonuses and Reviews! Free slots games and spins bonuses for new online slot machines. New slots launch all the time, monthly for Net Entertainment and Microgaming often launch more than one new slot a month. This is where you will find bonuses for the most popular online slots! We list all the casinos that offer free spins no deposit for top slots from NetEnt, Microgaming and more. Move over Starburst™, we have a new NetEnt slot king – BerryBurst™ is a low to medium variance slot with a 96.56% RTP and a very familiar playing style! If you are one of the millions of people who love Starburst, this is a slot you will have to try. It plays in a quite a familiar style, using NetEnt’s ‘Cluster Pays’ game engine to deliver an updated version of the classic Starburst slot. But wait there’s MORE! NetEnt are releasing a companion slot at the SAME TIME – called BerrryBurst MAX™ – which is the same game with higher volatility and bigger wins. Pyramid: Quest for Immortality™ is a fantastic NetEnt slot that features a ‘Wild Rockets’ style vertical layout, and loads of Egyptian themed bonuses and surprises! Grab the best free spins bonus deals to play with here. 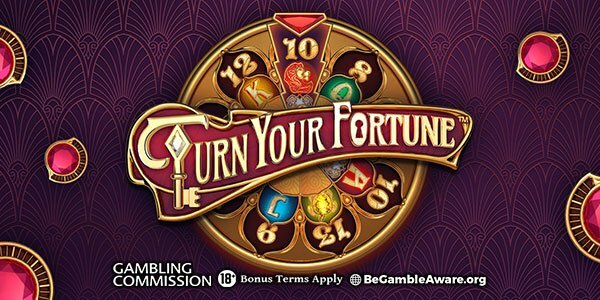 Turn Your Fortune ™: Play Now Free Spins and Bonuses! Turn your Fortune ™ is a fantastic slot from NetEnt that has a unique new game mechanic. At first we didn’t know what we were doing, and when the scatter on the first reel appeared we thought it was the usual ‘three and in’ bonus round…but no! It’s quite an intriguing game. It plays somewhat like The Wishmaster, even though it’s completely different. There is just something about the sense of ‘this is utterly destroying my balance wtf’ that will feel familiar to anyone who has played Wishmaster. Yes this is an expensive slot, and while it can produce a lot of little base game wins it still crunches through your cash relentlessly. New Motörhead™ from NetEnt Free Spins Bonuses including no deposit bonus deals, free spins no deposit and big real money cash match bonuses from the best online casino sites! This is a big one! We were so excited about this slot it was unreal. The music of Motörhead is a favourite with the team here and we love to rock out in loving memory of Lemmy and the gang! We have all the best Motörhead Video Slot™ free spins bonuses right here. Sign up and play with no deposit free spins or make a deposit to claim match bonus packages and extra bonus spins. Good luck, LET’S ROCK! Sign up now and get 15 Free Spins with no deposit required on Fairytale Legends: Red Riding Hood, Starburst™, Mega Fortune™, Motörhead Video Slot™, Aloha! Cluster Pays!™, or Guns N’ Roses™ + an extra 5 SUPER Spins and 50 Bonus Spins on deposit! Sign up for 10 No Deposit Spins on Twin Spin, Mega Fortune Dreams, Jack and the Beanstalk, Motorhead, or Gonzo’s Quest! Up to 190 more spins on the same Net Ent games and a 200% Bonus on a first deposit of £10-100. Sign up and get 10 No Deposit Spins now! Play this slot at these NetEnt casinos! Get Free Spins bonuses for NetEnt’s ‘Dead or Alive’ slot, one of the best high variance Net Entertainment slots around! Win big from tiny stakes. If you played Dead or Alive (aka DOA) without any prior knowledge of this slot, you would be forgiven for thinking that it was a boring way to spend your time. The wins always seem to be tiny, and the bonuses are hard to hit. So why would anyone bother with it? The answer is simple…no other slot has the ability to turn a tiny stake into a GIANT payout like Dead or Alive. Dead or Alive is a high variance slot with a reputation for producing some of the biggest (non progresive) wins in online casino gaming history. NetEnt’s Twin Spin ™ online slot is great to play on your mobile phone or desktop computer. If you are looking for free spins and bonuses, or to try it for free in demo mode, you are in the right place! Click the button to try the Twin Spin™ slot right now! Twin Spin™ is a 1970s themed disco style slot machine from NetEnt. It brings together the latest in 21st century online gaming with the best features of a bygone era when Vegas was at its peak and everything was so much funkier! The reels that spin together at the start of each spin can become triple, quadruple or even quintuple matched reels that guarantee spectacular wins! This slot is one that you will love right from the start as the excitement is non-stop and every spin brings big thrills. Get Free Spins to play NetEnt’s incredible looking and sounding Japanese themed slot Koi Princess here! Spooky Netent game Halloween Jack is a 5 reel, 20 payline slot with incredible graphics and the awesome ‘Walking Wilds’ feature as seen in Jack and the Beanstalk. With the potential to win up to 3000x stake on each spin, the Walking Wilds respins could see this generate some insane wins. We think this slot has real big win potential and offers high variance thrills for those brave enough to play it! Sink your teeth into all the very best Blood Suckers™ Free Spins Bonuses online. We’ve sourced casino offers from all over the internet to help you enjoy Netent’s horrifyingly brilliant slot with ease. Get your blankets ready as Netent’s thrilling horror themed slot, ‘Blood Suckers’, is a fast paced, big action game that’s themed on ghouls, vampires and ghosts…better play this slot with the light on! Bloodsuckers II is the new NetEnt slot which develops the graphics and gameplay of its classic predecessor and brings you more of the awesome vampire-themed action you crave! Here’s our brief Bloodsuckers II slot review: This slot keeps the best elements of the original Bloodsuckers, with an enhanced pick-a-win coffin round that now has extra in-play features and the same mechanism for activating bonuses and free spins. It also stays true to the original in the way it can give you some unexpected big hits out of the blue! This game is playable up to an utterly irresponsible £250 a spin, should you be insane enough to play it that way, and we found it to be horrifyingly fun. Play Bloodsuckers II slot now! We have a couple of great deals for new players who sign up at these casinos listed below. Check out the orginal Bloodsuckers Free Spins too! Casumo Halloween Week! Win cash prizes for playing spooky slots! Jungle Spirit is the latest NetEnt slot and we have hundreds of free spins many with no deposit required, so sign up now and claim yours! Play Jungle Spirit: Call of the Wild™ with free spins now! Double Stacks™ is the latest NetEnt slot and it features classic slot machine symbols on a familiar 5 reel layout. This slot launched in September 2018, so what is it like? Get the best NetEnt Zombies™ Free Spins Bonuses right here! This terrifyingly fun slot from Net Entertainment is the perfect game for the Halloween season. We hope you like our new online slots list! New online slots seem to appear almost daily. Keeping on top of them all can be hard! With some many software developers around all wanting to launch the next big thing, it keeps us all on our toes! Slots are one of the most popular games that are played at online casinos and in fact in land-based casino too! It’s no wonder when you think of all of the incredible themes, shapes and sizes they come in! And that’s before you take into account the attractive bonuses, free spins and fun features they can offer players! Online slots are arguably the most imaginative and innovative parts of online gambling. With groundbreaking graphics that can make a simple slot game look like a blockbuster movie! One thing to remember though is slots are for fun and should not be seen as a way of making quick cash. They are completely random, and the house will always have the edge. That’s not to say a nice little win may not drop in your lap once in a while! When it comes to variety, you really can’t beat slots! If you love sports-based games, there are hundreds available, fairytale, horror and even fruit themed slots can be found by the dozen! Software developers are also trying to mix things up with different reel sets ups. They have taken the typical old-school 5×3 reel layout and thrown that out of the window with expanding symbols, random reel shapes and sizes and even spiral designs like you’ll find in NetEnt’s Finn and the Swirly Spin! There is no telling where things will go in the future, but we sure want to be part of it! Did you know there are more than 600,000 slot machines in Las Vegas? Did you know the very first mechanical slot machine was called the “Liberty Bell” and was invented by Charles Fey? Did you know that slot machines now make up more than 85% of a casinos revenue? Now that is some interesting stuff! If you want to find out where to play free slots and claim bonuses our casino reviews will provide you with everything you need to seek out the biggest and best brands and of course the latest bonus spins offers.